While sound bar systems can offer a space-saving alternative to a full-fledged surround sound setup, a single speaker unit will always have a hard time providing the same level of immersion as a genuine multi-channel configuration. To help combat this issue, many manufacturers now implement virtual surround sound tech into their sound bars. Using special processing, these modes simulate the effect of multiple speakers around a user's room. And with Yamaha's latest model, the YAS-207, the company has teamed up with DTS to help introduce DTS Virtual:X. The new post-processing virtualization mode is designed to create an immersive audio experience with multiple dimensions -- including height -- from a single sound bar system without the need for ceiling speakers, upward firing drivers, or surround speakers. And while actual performance might not fully live up to that promise, the resulting soundscape does add a sizeable level of immersion, helping to give the YAS-207 a notable edge over other budget-priced sound bar models. The YAS-207 is a 200 watt sound bar system with a separate wireless subwoofer. A remote control, an optical digital audio cable, a mounting template, power cables, and a manual are all included in the package as well. From an aesthetic standpoint, the sound bar unit features a simple black color scheme with a non-removable cloth grill across the driver array, resulting in a basic yet pleasing visual design. The sound bar measures 36-5/8" x 2-3/8" x 4-1/4, offering a slim footprint that should complement a wide assortment of displays. Under the hood, the speaker features Four 1-3/4" woofers and Dual 1" tweeters. Meanwhile, the subwoofer unit features a 6-1/4" cone woofer and a slim, tall design, measuring 7-1/8" x 17-1/4" x 15-3/4". Resembling a typical desktop computer tower more than your average cube-shaped sub, the thinner build might make it easier to slide the woofer in between other pieces of furniture if space is an issue. Thankfully, unlike the more expensive YAS-706 model we reviewed previously, the YAS-207 features a clearly visible front row of LEDs, offering convenient and easy to decipher indicators for volume, source, decoder type, and sound mode -- whether the unit is placed flat on a TV stand or wall mounted. This might seem like a fairly unimportant change, but the indicator positioning and labels really do provide a much more user-friendly experience here, making it very simple to tell which surround mode is activated, how high the volume is, and what type of mix is being processed (and the lights can even be dimmed for those who don't like them). (Center Unit): 36-5/8" x 2-3/8" x 4-1/4", (Subwoofer): 7-1/8" x 17-1/4" x 15-3/4"
In general, setup is relatively simple. For review purposes, I tested the sound bar with a Samsung KU6300 4K Ultra HD TV and a 2017 VIZIO E-Series 4K Display (full review coming soon), along with a variety of media devices connected via optical or HDMI, including an LG UP970 Ultra HD Blu-ray player, Kaleidescape Strato player (full review coming soon), and a Roku 3. To get things started, customers simply need to plug in the included power cables for the sound bar and subwoofer, and then connect the desired playback device to one of the sound bar's inputs. 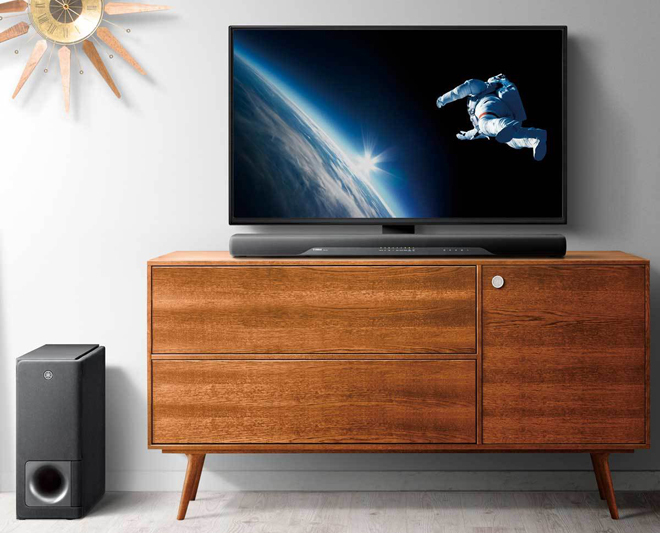 Once everything is connected, the subwoofer automatically pairs wirelessly with the main sound bar unit. Unlike other more expensive models, the YAS-207 does not feature a dedicated calibration process or microphone, and sadly there is no support for Wi-Fi or Yamaha's MusicCast multiroom audio system. Users with an ARC (audio return channel) compliant display can also take advantage of the sound bar's ARC support, allowing them to connect an HDMI cable from their display's ARC port to the sound bar's ARC connection in order to play audio from the TV and any other devices connected to the TV. Once the HDMI-CEC (Consumer Electronics Control) setting was enabled in my Samsung display's menu, this featured worked without any issues, allowing the sound bar to play audio from the TV's internal apps and other components connected to the TV. Likewise, I could also control the sound bar's volume with my Samsung remote. Unfortunately, I ran into some issues when using the ARC feature on the VIZIO display. With the CEC option enabled in the display's menu, audio was initially sent to the sound bar just fine and I could also control the volume with the VIZIO remote. However, once I started to play content from apps like Netflix and Amazon through the integrated SmartCast TV platform or a Roku 3 connected to the display, the audio would cutout and the decoder LED light would switch off every time I paused and resumed or fast-forwarded/rewound a video. To get the audio back, I would have to change the source on the sound bar and then change it back to TV. Likewise, even if the audio did end up returning once toggling through sources, sometimes it would start to stutter and the decoder LED light would intermittently flash. This made watching content through ARC from the VIZIO more trouble than it was worth. But since this issue did not occur on the Samsung TV, it appears to be a problem with the VIZIO display's ARC implementation and not the sound bar itself. Thankfully, audio playback through the optical connection was flawless from both displays (and even passed through sound from other connected devices), and the HDMI video passthrough feature worked without any problems, transmitting 4K HDR video at up to 60fps from the Strato player and Ulra HD Blu-ray player. Finally, users can toggle through stereo, surround, and DTS Virtual:X modes with the included remote or the Yamaha Home Theater Controller app for iOS and Android via Bluetooth, along with options to turn on a Bass Extension mode and a Clear Voice mode. It should be noted, however, that while my review unit came with DTS Virtual:X pre-loaded, some users will need to download a firmware update to add the feature. To evaluate the YAS-207, I watched a variety of Blu-ray discs, streaming content, and Strato player downloads with various Dolby, DTS, and PCM mixes, including titles like Passengers, The Fate of the Furious, The Man from U.N.C.L.E., Game of Thrones, The Avengers, Inception, Twin Peaks, Orphan Black, Batman v Superman, and The Fifth Element. Overall, the system provided an immersive experience, offering an extensive soundstage for a sound bar -- especially when using the new DTS Virtual:X mode. With that in mind, I primarily watched movie content with this setting on, but I did switch back to stereo and the standard surround mode for comparisons sake. While the regular surround mode did a very solid job of extending the soundstage when playing surround sound content, switching to the DTS Virtual:X mode often revealed an appreciable upgrade to the audio's sense of scope. To this end, DTS Virtual:X frequently made ambient effects sound much more pronounced, adding new emphasis to atmospheric sounds that were otherwise flat or lost in the background of tracks when the mode was off. Running through a few clips found on a DTS demo disc highlighted this well. A piece titled Locked Up, featuring a fly buzzing around a frog, was much more dynamic and spacious with Virtual:X switched on, creating an extra sense of dimension as the fly moved closer and further away from the listener, providing a more precise level of placement for each effect. A music video for the band Run River North also benefited nicely from the mode, resulting in an added level of dimension to the vocals and wider, more distinct separation for the instruments. Car chases in Fate of the Furious and The Man From U.N.C.L.E were similarly engaging, as were battle scenes in Game of Thrones, bringing out nuances in each mix that were less distinct in the regular surround mode. Likewise, though the YAS-207 does not technically decode object-based formats like Dolby Atmos and DTS:X (they are processed as standard 5.1), the DTS Virtual:X tech does upmix and simulate height channels during playback -- and this feature did frequently make it sound as if certain effects were higher than others, almost as if the audio plane extended a few feet above the sound bar. With that said, the height and surround effects were not as convincing as those created by more expensive sound bar models equipped with actual upward firing drivers or beam drivers to precisely bounce sounds around a room. DTS Virtual:X did open up the soundstage to a noticeable degree, but the mode never really made it seem like effects were genuinely above or behind the listening area. Likewise, though Virtual:X was my preferred way to listen to multichannel movie mixes on the YAS-207, the mode's processing could have an overly aggressive quality at times that made some mixes sound a little unnatural. The benefits of the processing during surround sound content usually outweighed the tech's drawbacks, but two channel and mono material were another story. When upmixing stereo content, Virtual:X often created a harsh, artificial sound -- particularly with dialogue in talk shows. Thankfully, the standard stereo mode and regular surround mode don't have this problem, so customers can always switch to them for a more natural sound if Virtual:X is not to their liking. Moving on to bass, the included subwoofer is decent but definitely lacks the full home theater impact of a larger unit. At its default setting, the sub sounds a bit underpowered with certain material. Key LFE cues during the wildfire explosion in Game of Thrones and the falling debris scene in Transformers: Age of Extinction sounded particularly flat. Pumping up the sub levels and turning on the bass extension mode did bring more heft, but this could come at the expense of overall balance with the sound bar. I generally found that a +2 sub level with bass extension on offered a decent trade-off. And on the plus side, even when maxed out I never detected any unwanted rattling. Finally, I also sampled a variety of streaming music tracks via Bluetooth from my smartphone and Spotify through my Roku 3, including songs from artists like Norah Jones, Radiohead, Gnarls Barkley, The National, The Beatles, OutKast, Post Malone, Arcade Fire, and Ariana Grande. While Bluetooth playback sounded oddly flat, Spotify tracks through the Roku were surprisingly dynamic and spacious with great separation and a nicely balanced profile in the standard stereo mode. Likewise, the subwoofer actually seemed to be better suited for music than movies, providing some solid bass beats and kick in tracks like Gnarls Barkley's "Crazy" and OutKast's "Sorry Ms. Jackson." It should be noted, however, that like other 2-channel content, music sounded harsh and artificial with the DTS Virtual:X mode turned on. With engaging stereo music playback and immersive DTS Virtual:X processing for movies, the YAS-207 sound bar proves to be a very strong performer for its price range. Though Virtual:X never really creates a sense of overhead or rear sound, the mode does provide a notable expansion of the soundfield with higher planes of audio and more prominent ambience. LFE can't compete with a full-sized subwoofer, but the system as a whole should pack enough power for small to mid-sized rooms. And while it would be great to have Yamaha's MusicCast multi-room audio platform included, this is an understandable omission for the $300 price. If you're looking for a sound bar with truly convincing overhead effects, you'll still need to opt for a much more expensive model with upward-firing drivers. But if you're in the market for a budget-friendly sound bar, the YAS-207 with DTS's new Virtual:X mode should be on your shortlist. Recommended.